We’ve just published the second issue of Twin Cities Veg Living, and we’re very excited to share it with the world. This annual 12-page magazine is a way for us to share who we are and what we do. You’ll find that our campaigns, programs, values, and mission are represented in its contents. Along with that, the magazine is a useful resource for those moving toward a plant-based diet. 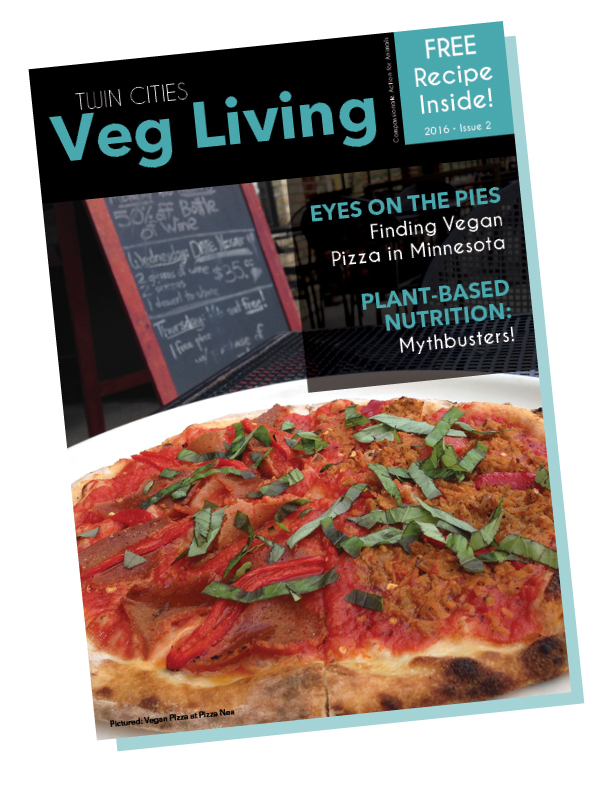 It features information that’s especially relevant to those who live in the Twin Cities area, and it shows how veg-friendly our community is becoming. If you haven’t seen the magazine yet, you can find it at our tabling events throughout the year or read it online. Thanks to all of these contributors who wrote articles, took photographs, and edited the various drafts. Special thanks to CAA intern Sydney Terwey for her illustrations and to graphic designer Melissa Swanson for the layout. Aside from Unny and me, all of these contributors are volunteers. Their passion for animal issues is what stirred them to be a part of this project, and we are very grateful for their service. We hope that the magazine helps to open hearts and minds to make this world a kinder place for animals. In addition to sharing the magazine at local events throughout the year, we’ll bring it with us to Washington D.C. for Taking Action for Animals in June and to Los Angeles for the Animal Rights National Conference in July. Making the magazine available to other animal advocates from around the country, we’ll be able to share our local successes with the global community and get our name out there. If you can’t wait until the next CAA event to get a copy of the magazine, feel free to stop by the CAA Community Space at 2100 1st Avenue S in Minneapolis. Email me at justin@exploreveg.org to arrange a time to pick one up. Be sure to grab a few extra copies to share with your friends. By the way, our Vegan Pancake Brunch Feed-In is just around the corner. Join us on Saturday, April 30 from 11:00am to 1:00pm at the University Baptist Church and enjoy free pancakes and coffee. Just bring a vegan breakfast dish to share and have a ball. Please RSVP on the Facebook event page or email me at justin@exploreveg.org.